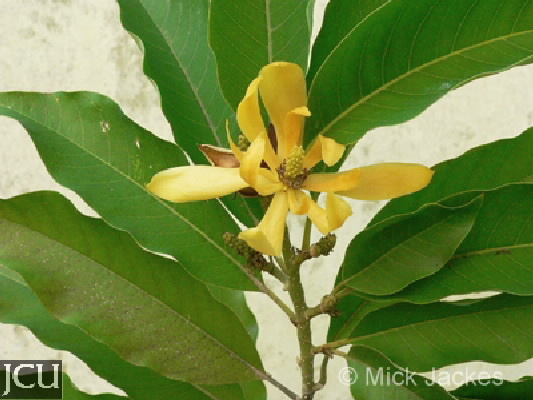 This small tree originally from China, has alternate, lanceolate leaves to over 20 cm long that are slightly curved. The flowers are fragrant, a mustard yellow colour, and in each flower the ovaries are free from one another. The central stalk or receptacle elongates and bears the developing fruits along it. When fully developed each individual fruit is about 2.5 cm long, with a reddish tinge and whitish pustules; this follicle opens to release orange-red seeds.